We attended our first big trade show this past weekend, exhibiting at the famed One Spark Festival in Jacksonville, Florida. Since it’s inception in 2011 it has quickly become the world’s largest crowdfunding festival. The streets were lined with exhibitors, entertainers, vendors, and “creators” – the OneSpark term for young companies looking to get funding for their product (think Kickstarter meets the County Fair). Although we weren’t looking for funding, the feedback we received was amazing. The community of entrepreneurs showcasing there and the spirit of collaboration left us inspired. As a result, we are excited about attending it again in 2016 with a revamped exhibit and hopefully new goals. Our soundproofing curtains continue to gain momentum in the market, as the only STC-rated acoustic curtains out there. Thank you for all of your support over the past year, and we hope to keep growing and improving our product in the months and years ahead! 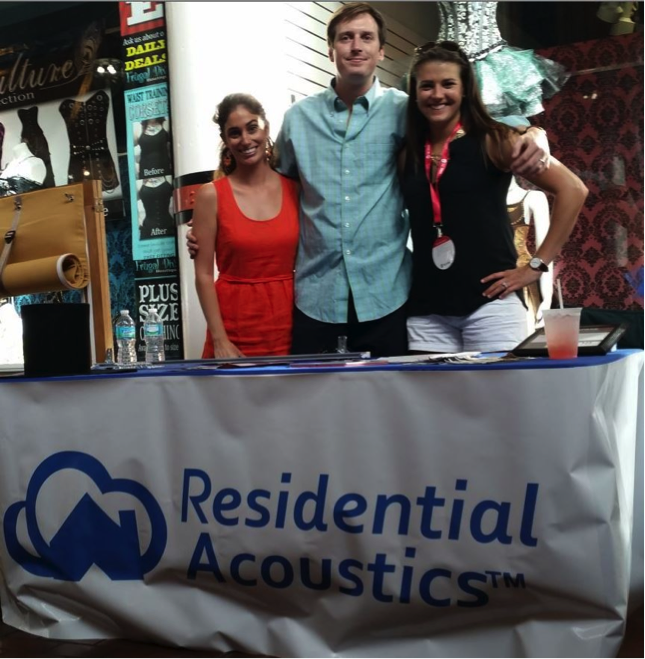 Our Residential Acoustics team enjoying OneSpark. Come see us next year!